"Dark Matter", the new video from ONCE HUMAN, the band featuring former MACHINE HEAD and SOULFLY guitarist Logan Mader, can be seen below. 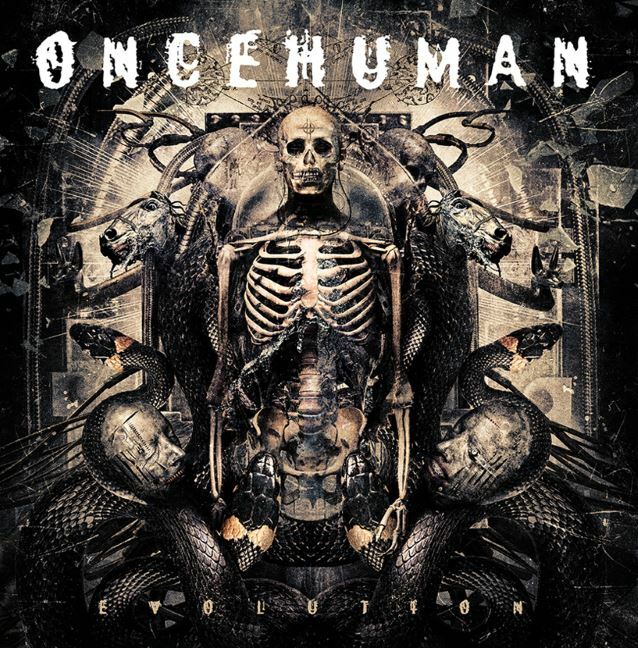 The song is taken from ONCE HUMAN's second album, "Evolution", which will be released on February 17 via earMUSIC/eOne. Vocalist Lauren Hart states: "This vicious new track, 'Dark Matter', is about the dark energy in the world that affects us at our core. You can hold on to it and let it destroy you or you can let it flow through you and grow above it. It is there to strengthen you; letting it destroy you is a choice." Adds Mader: "We worked with director Brian Cox (GEMINI SYNDROME) for this video. We gave him complete creative control over the imagery and he did not disappoint. He read the lyrics and was inspired. We are really happy wirh how it came out and hope you enjoy it." "Evolution" is not just the title of ONCE HUMAN's sophomore release, it's an armor-plated declaration. Having made waves with their 2015 debut, "The Life I Remember", the band has dramatically progressed beyond the melodic death metal sound of that release into something more complex, emotional, distinct, and devastatingly heavy. "Having been focused on recording, producing and developing bands, I had not picked up the guitar out of passion for twelve years but as soon as I started writing with Lauren, I fell in love with what we were making, and I wanted to play in the band and get back on stage," states Mader, whose name will be familiar to metalheads not only for his production and/or mixing work on records from the likes of GOJIRA, FEAR FACTORY and DEVILDRIVER, but also as the original guitarist in MACHINE HEAD, and his late-'90s stint in SOULFLY. With the lineup rounded out by drummer Dillon Trollope, bassist Damien Rainaud and guitarists Skyler Howren and recent recruit Max Karon, everything about "Evolution" makes it clear that this is a band pushing itself to deliver something that truly stands apart. "Our first record was getting the ball rolling, but now it's as if we're a totally different band," says Mader. "We really found our sound and our identity — it's quite unique — and I think what we're doing is really on fire." With the intensity and range of Hart's roar having drastically increased, she unleashes it across complex and constantly shifting time signatures, and thick, contorted riffs that land with sledgehammer force. However, this is not only about bludgeoning the listener into submission, the violence often juxtaposed with eerie atmospherics and dark melodies to create something with great depth.